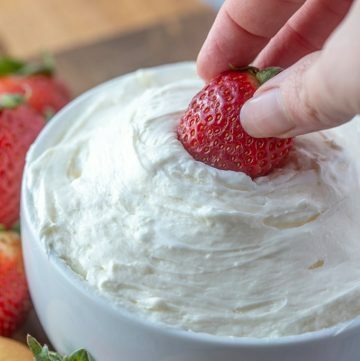 Marshmallow Cream Cheese Fruit Dip is easy to make in five minutes and with only two ingredients. 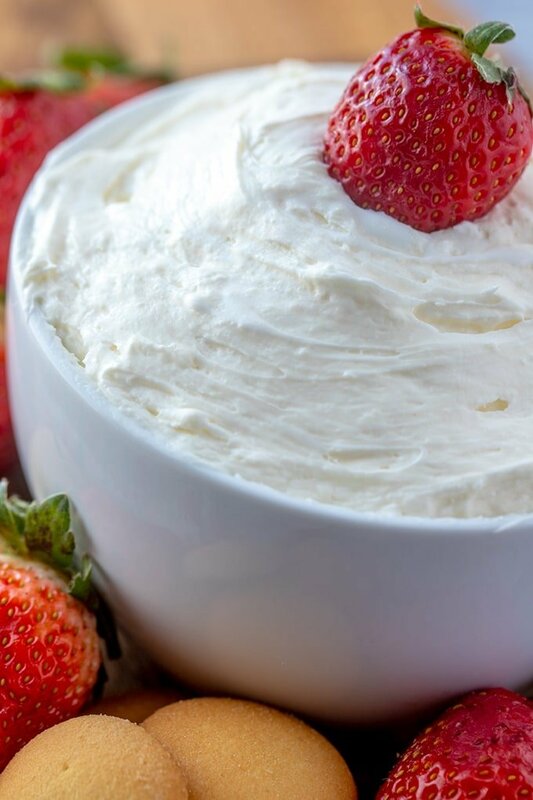 Sweet and creamy, it’s the perfect dip for your favorite fresh fruits, cookies, and wafers. G and I are especially excited about this year’s Superbowl (yay, RAMS!) and we plan to go all out with the party food even if it’ll be just the two of us at home watching the game. When I say all out, I mean nothing fancy really. It’ll be just a simple lineup of chips and assorted dips such as cheesy buffalo chicken, jalapeno popper, guacamole, and fresh salsas. And of course, this creamy marshmallow dip to round off our savory treats with something sweet. 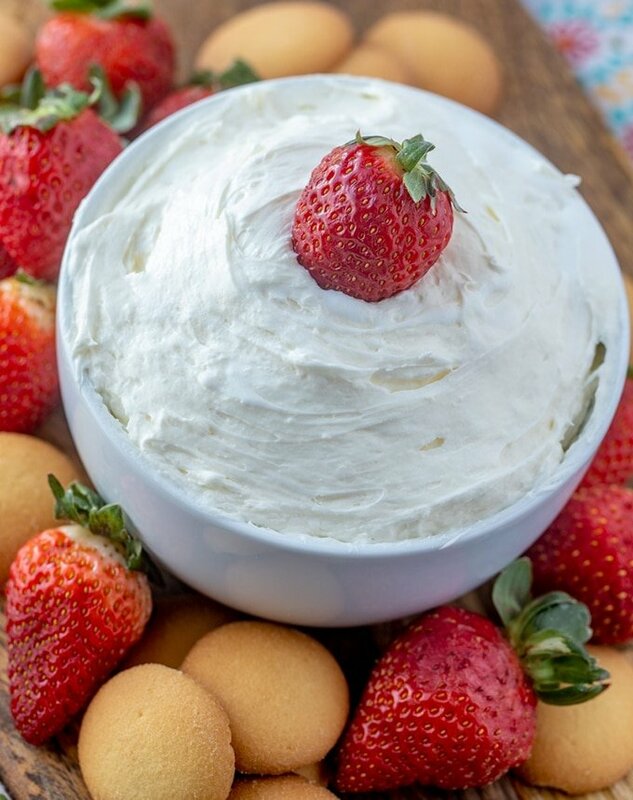 Creamy, fluffy and perfectly sweetened, this cream cheese and marshmallow fruit dip is super addicting. Not only is it amazing as a dip for fresh fruits, cookie wafers, and pretzels, but it also makes a delicious frosting over muffins, cakes, and pastries. It’s so good, I can just eat it with a spoon! This fruit dip is so easy to make, all it needs is 5 minutes and TWO ingredients. Whisk together a tub of marshmallow creme and a block of cream cheese together until smooth and well-blended and you have 2 cups of scrumptious treat to swoon over! To easily remove marshmallow creme from the jar, microwave on HIGH for about 30 seconds. Want to trim down the fat? 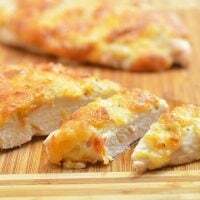 Swap the cream cheese with Neufchâtel. Whip in 1 tablespoon orange juice concentrate and 1 teaspoon of orange zest for a refreshing layer of flavor. For a fluffier consistency, beat marshmallow creme and cream cheese until smooth and then gently fold in 8 ounces of Cool Whip. Make the dip extra fun with toppings such as granola, sprinkles, chopped nuts, and mini chocolate chips. Combine 8 ounces cream cheese, 1 cup plain yogurt, and 1/4 cup powdered sugar. Using a hand mixer, beat until smooth and well-blended. For a healthier alternative, substitute honey for the sugar. Cream cheese dip can be made ahead and refrigerated for up to 4 hours in advance. 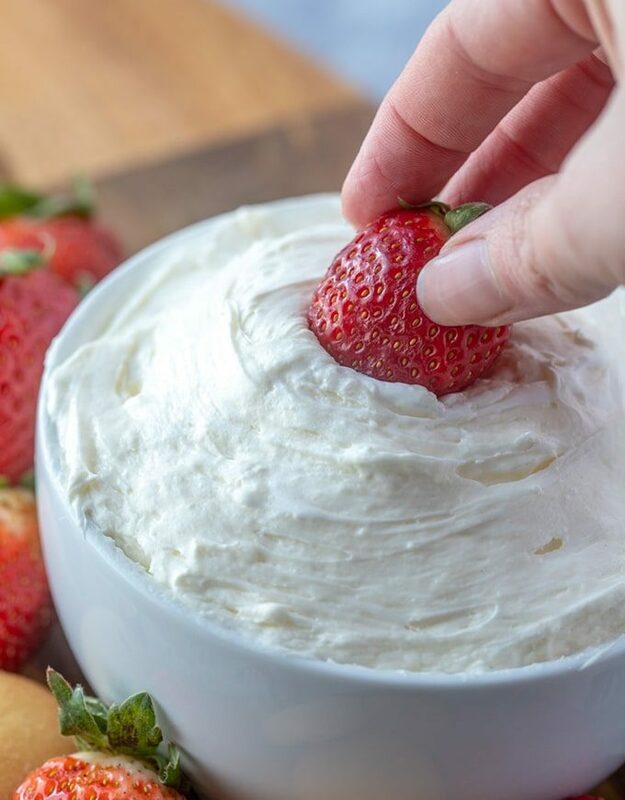 Marshmallow Cream Cheese Fruit Dip is easy to make in five minutes and with only two ingredients. Sweet and creamy, it's the perfect dip for your favorite fresh fruits, cookies, and wafers. In a bowl, combine marshmallow creme and cream cheese. Using a mixer, beat together until smooth and well-blended. Serve with cut-up fresh fruit of choice.